Acadia National Park’s carriage road system, built by John D. Rockefeller Jr., has been called “the finest example of broken stone roads designed for horse-drawn vehicles still extant in America.” Off-limits to motorized vehicles (except motorized wheelchairs), the scenic roads and their 17 historic stone bridges are used by hikers, runners, bicyclists, cross-country skiers, and equestrians. A generation ago, the park faced a seemingly insurmountable backlog of maintenance on the roads and some wondered whether they should be allowed to grow in as simple walking trails. When the carriage roads were gifted to Acadia National Park by the family of John D. Rockefeller upon his death in 1960, the park lacked the resources to add staff to perform annual upkeep. Instead of Rockefeller’s seasonal maintenance staff of 40, the system now shared the attention of the park’s small road crew. Without annual upkeep, leaves and woody growth choked the drainage system and erosion led coping stones to tumble out of place. As the upper layers of gravel were lost and vegetation grew on the road surface, erosion accelerated. 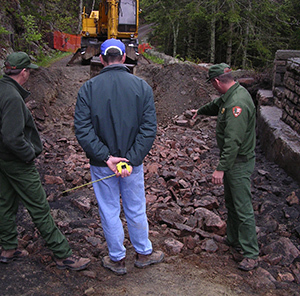 The carriage roads were among the Friends of Acadia founders’ earliest priorities, and their restoration was the young organization’s first major achievement. 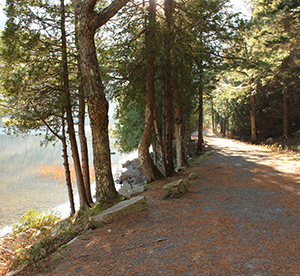 Between 1992 and 1995, an extensive rehabilitation of the carriage roads was financed by federal construction funds along with matching private funds from Friends of Acadia that created the Carriage Road Endowment. Today, Friends of Acadia grants more than $200,000 from this endowment to the park each year, to ensure that the carriage road system will be maintained in pristine condition. Join Friends of Acadia and Acadia National Park each fall on the first Saturday in November, for Take Pride in Acadia Day—a giant volunteer work party to clear fallen leaves and debris from the carriage road drainways before winter. This single morning of volunteer effort protects the road surfaces from erosion and other seasonal damage, potentially saving the park thousands of dollars in repair costs each year. Take Pride in Acadia Day from Friends of Acadia on Vimeo.